American Girl is ringing in the New Year with the debut of Gabriela McBride™, the company's new 2017 Girl of the Year™. Gabriela is a true creative talent who uses the power of poetry to help her break down barriers and overcome a personal challenge with stuttering. Gabriela comes to life for girls via a beautiful 18-inch Gabriela™ doll featuring curly dark-brown hair and warm brown eyes, an exclusive outfit that reflects her creative side, and a book chronicling her story. Gabriela also comes with several performance-inspired outfits and accessories, including a dance barre, rehearsal and dance outfits, plus pretend headphones and a microphone. Additional Gabriela products and books will be available starting in spring 2017, and—for the first time—the new Girl of the Year collection will be available for a full 12 months and beyond. Gabriela's story will be told in a series of three books published by Scholastic and written by Teresa E. Harris. The first book Gabriela, hits shelves in January and tells the story of a quiet and creative girl growing up in a family of artists. Gabriela inherited a love of the arts from her parents, especially her mother, but spoken word poetry is becoming her own passion. Although Gabriela often finds herself in a battle with her own words because of her stuttering, she discovers that her poetry, filled with wit and honesty, helps her speech flow more easily and gives her the confidence to find her voice to help save her beloved community arts center from being torn down. To connect both boys and girls with Gabby's inspiring message, American Girl is partnering with Scholastic, the world's largest publisher and distributor of children's books and leader in comprehensive educational materials, to create and distribute Express Yourself, a custom curriculum program that teaches 3rd-5th grade students how to use poetry as a tool for self-expression. The free materials will be available on scholastic.com starting March 1, 2017, and include teacher lessons and corresponding classroom activities, a poetry poster, plus parent tips and learning ideas to do at home. In addition, to celebrate National Poetry Month, the program also features a poetry contest for students that will run throughout the month of April. The Express Yourself program will encourage all students to find their creative voices and share their own personal stories, while building confidence along the way. The Gabriela collection is available on Jan. 1, 2017, through American Girl's catalogue, at americangirl.com, at all American Girl retail locations nationwide; at American Girl specialty boutiques at select Indigo™ and Chapters™ in Canada and El Palacio de Hierro locations in Mexico City; and at Toys "R" Us stores starting in March. The Gabriela books can also be purchased through retail and online booksellers. 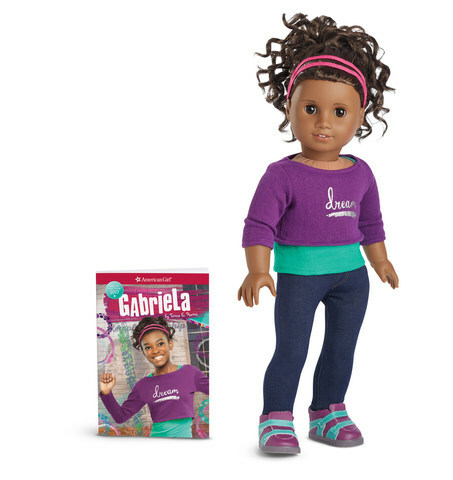 To learn more about Gabriela and the Girl of the Year™ line, go to americangirl.com, Facebook at facebook.com/americangirl, Twitter at @american_girl, Pinterest at pinterest.com/agofficial, and American Girl's Instagram page at instagram.com/americangirlbrand. To request an American Girl catalogue, call 1-800-845-0005.